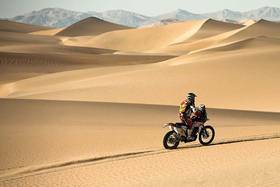 SA-Dakar Rally: Speedbrain - "The final demanding test of this year´s race". The penultimate stage of the Dakar 2012 provided one more strong result for the Husqvarna Speedbrain Team. 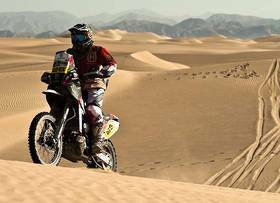 Spaniard Joan Barreda and Portuguese Paulo Goncalves finished not far behind today´s winner in what´s been the final demanding test of this year´s race. Barreda and Goncalves were understandably aiming at a top score. They both delivered. Joan had closed in on Marc Coma soon after the start. 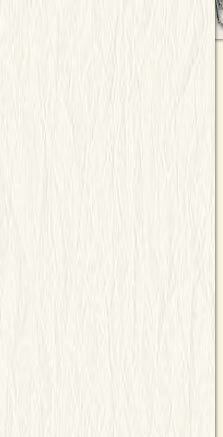 But a small navigation mistake made him drop back for a little time. The talented Spaniard bounced back and then took command of the proceedings. He arrived at the finish in a well deserved fourth position. "For me it was the best day since we started competing and I feel more satisfied" said Barreda after the stage. "I've been opening the track for some parts of the stage, with a very difficult navigation, later I lost nearly 5 minutes by driving wrong." Paulo Goncalves was just 33 seconds behind. The Portuguese earned fifth position on the day, after having made a minor mistake and still running with the front guys. Jose Manuel Pellicer and Zé Hélio were having fun on the ride from Nasca to Pisco. The dunes and landscape proved fascinating and very challenging in terms of navigation. Everything okay was the summary of the team ahead of the final stage. The Dakar 2012 ends tomorrow in Lima. The Peruvian capital will be reached after 245 km of connecting stage and a very short special test (29 km). Then it´s time to celebrate.